The Little Mermaid 30th Anniversary Edition is now available on 4K Ultra HD and Blu-ray (the release came out on digital February 12). 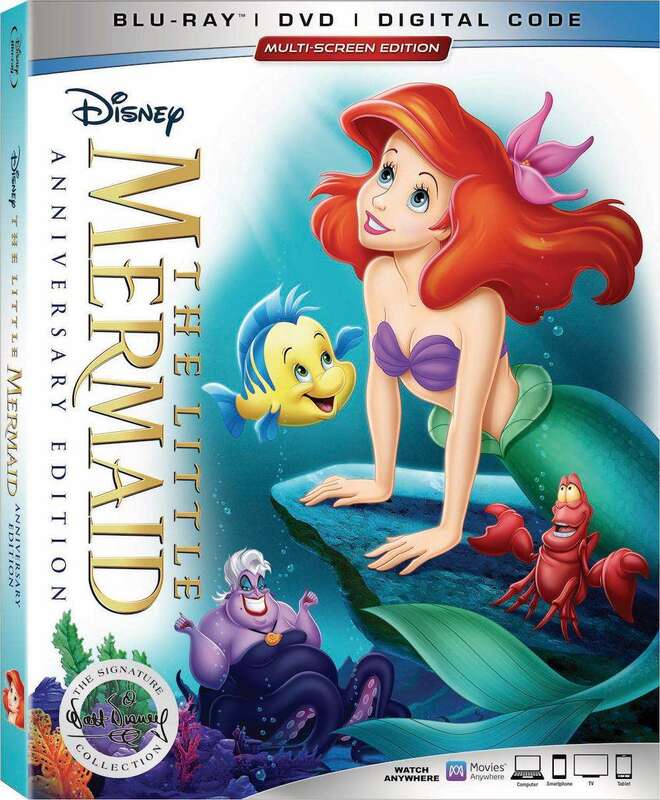 With this release, The Little Mermaid is now the seventh title to become part of the Walt Disney Signature Collection, as it follows the classics Snow White and the Seven Dwarfs, Beauty and the Beast, Pinocchio, Bambi, The Lion King, and Lady and the Tramp. New special features on the disc includes original recording sessions of The Little Mermaid, the DCapella music video “Part of Your World,” a featurette on Walt Disney (Stories From Walt’s Office – Gadgets & Gizmos), and #TreauresUntold (which has Coop and Cami Ask The World stars Ruby Rose Turner and Olivia Sanabia interesting facts about The Little Mermaid). The special feature that is a total must see is “Alan Menken & The Leading Ladies Song.” The segment has Menken sitting down and reminiscing with actresses Jodi Benson (The Little Mermaid), Paige O’Hara (Beauty and the Beast), Judy Kuhn (Pocahontas), Lillias White (Hercules), and Donna Murphy (Tangled). Each actress gets to sing a few notes with Menken and reflect on their Disney film experiences, and late lyricist Howard Ashman is also remembered during the conversation. We interviewed Benson back in 1997 for an earlier release of The Little Mermaid, and in the clip below she talks about how she had “no idea” that The Little Mermaid, which she described as a “wonderful surprise,” was going to be a huge hit. To listen to archival interviews with Benson, Howard Ashman, Roy E. Disney, and Alan Menken, check out the podcast Matt and Greg Used To Interview Movie Stars. Kevin Hart and Tiffany Haddish are the stars behind the comedy Night School, but it’s a talented ensemble cast that basically steals the show. Fans of the stars will probably satisfied by their banter, but there are a ton of jokes to go around in the comedy. Teddy’s classmates include a convict (Fat Joe) who attends class via Skype, a neglected housewife (24’s Mary Lynn Rajskub), a conspiracy theorist (Romany Malco), a clueless but loving dad (Rob Riggle), a waiter (Al Madrigal) who lost his job thanks to Teddy, and a rebellious youth (Anne Winters). Saturday Night Live vet Taran Killam rounds out the cast as Stewart, the high school principal who, along with having a strange fixation for the Morgan Freeman flick Lean on Me, has a bone to pick with Teddy. 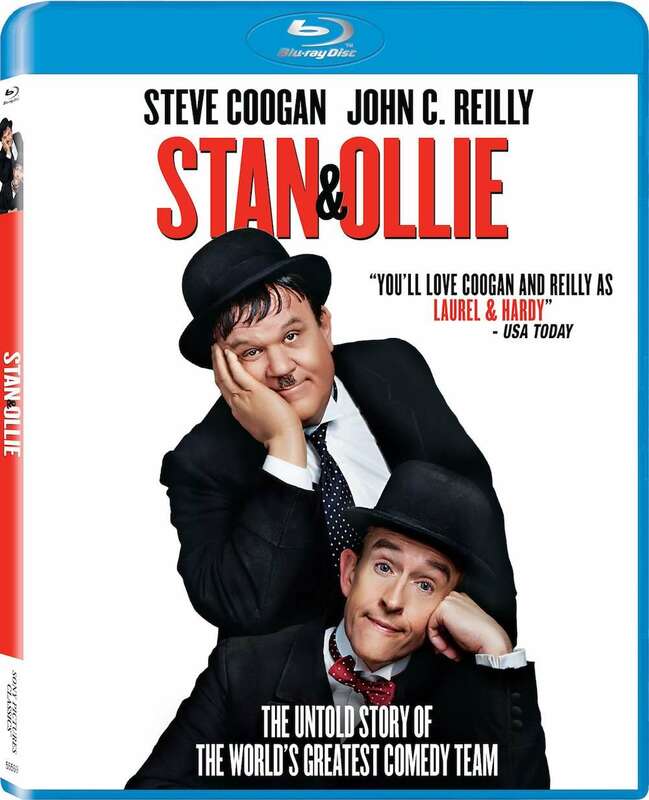 Special features on the Blu-ray and 4K Ultra HD versions includes feature commentary, an extended cut of the flick (it runs four minutes longer at 115 minutes), gag reel, alternate opening, several featurettes and audio commentary from director Malcolm D. Lee (the DVD comes with the extended cut, delete scenes, and alternate opening). Fans of Night School should definitely check out the 13 minutes worth of deleted scenes, as they give more screen time to Teddy’s classmates and his girlfriend. These sequences are not features, by the way, are not in the extended version (which probably means the original version of the feature ran close to 130 minutes). 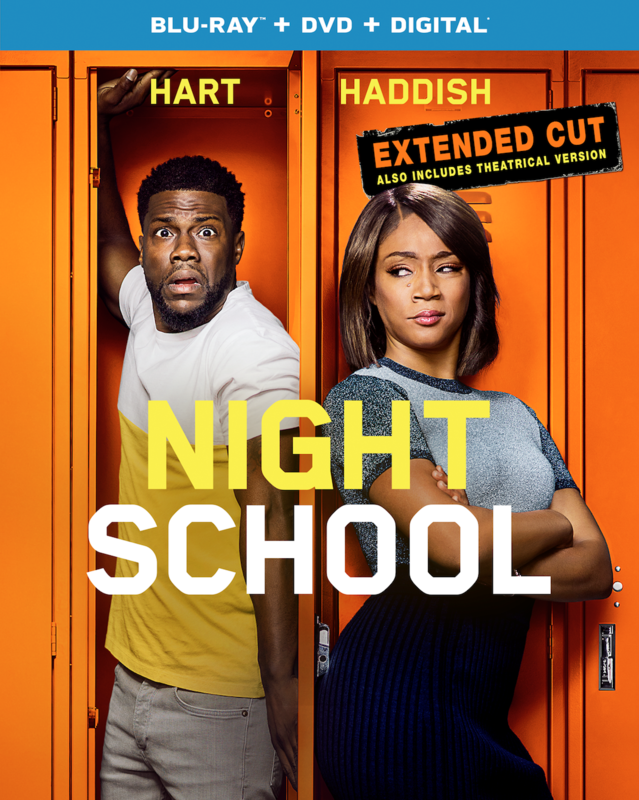 Night School is now available on Blu-ray, 4K Ultra HD, and DVD via Universal Pictures Home Entertainment. 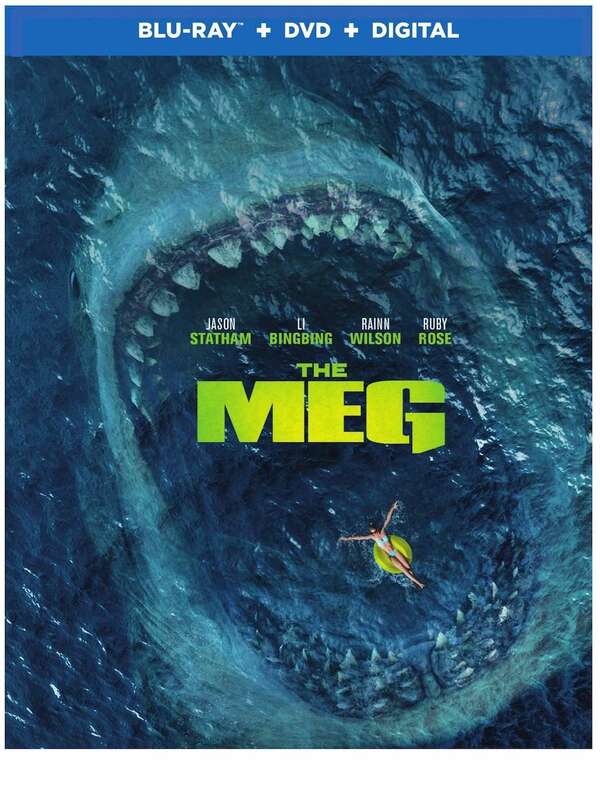 The Meg, which amassed over $525 million worldwide, is hitting Blu-ray and DVD on November 13 via Warner Bros. Home Entertainment (its digital release is set for October 30). Aside from the great idea of having action Jason Statham attempt to take down a 75-foot shark dubbed the Megaladon, the picture is also directed by ever ready veteran Jon Turteltaub, the filmmaker behind the successful National Treasure films and the 2013 charmer Last Vegas. Ruby Rose, Li Bingbing, and Rainn Wilson round out The Meg’s ensemble. Were you a fan of The Meg and are you looking forward to its Blu-ray and digital release? Feel free to comment below! Sandra Bullock is good friends with Gravity co-star George Clooney (he also executive produced Our Brand Is Crisis), so the A-list actress seems like the perfect choice to steer the Ocean’s franchise into a new direction. 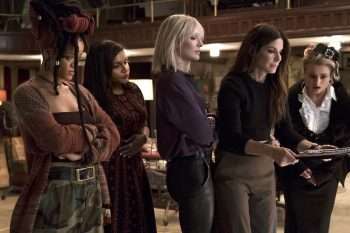 Ocean’s 8, which hits Blu-ray and DVD on September 11, proved to be a box office hit (it made over $294 worldwide) and a sequel (though it hasn’t been announced) should be in the offing. Just released from prison, Debbie Ocean (Sandra Bullock) concocts a plan to steal a $150 million diamond necklace that will be worn by actress Daphne Kluger (Anne Hathaway) at the Met Gala. Along with her partner-in-crime Lou (Cate Blanchett), the pair enlist a hacker (Rihanna), diamond expert (Mindy Kaling), pickpocket (Awkafina), fashion designer (Helena Bonham Carter), and a Connecticut based fence (Sarah Paulson) to pull off the operation. Though Ocean’s Eleven filmmaker Steven Soderbergh and Clooney are not present, Ocean’s 8 follows the tried and true formula while carving out territory of its own. Filmmaker Gary Ross (Free State of Jones) brings a light touch to the proceedings, and fans of the previous films should also be satisfied with the breezy yet intricately woven Ocean’s 8. One of Guy Pearce’s best known roles was as an amnesiac whose memory slightly comes back to him via Polaroid pictures in Memento, and in Spinning Man he’s afflicted with a similar condition. Evan Birch (Pearce) is a college philosophy professor who, although being a family man (Minnie Driver plays his wife), has lecherous tendencies to his students. 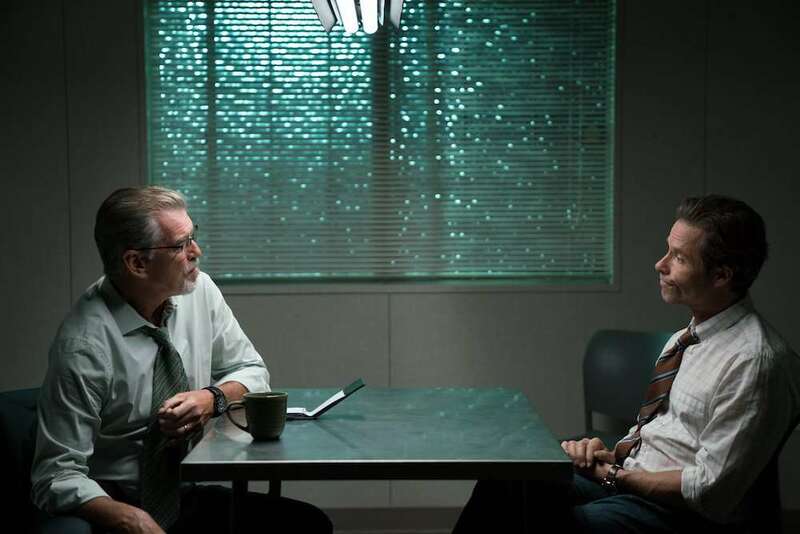 When a 17-year-old girl (Odeya Rush) goes missing, Detective Malloy (Pierce Brosnan) places Evan as the primary suspect. Alexandra Shipp co-stars as a fellow student who finds herself attracted to Evan, and her infatuation may lead to disastrous results.